I am a Autoditactic crochet thread artist. 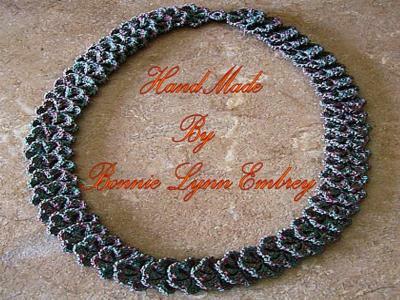 I crochet many things but just recently I have designed and crocheted my own neck, anklet and finger jewelry. This one here is just one of the 20 necklaces I have created. With all but perhaps one necklace, each piece is crocheted and linked to the other, and then attached by the ends with a single bead crocheting thru the bead hole using a fancy single crochet stitch and bringing the ends together. I use 2 different colors of the finest DMC crochet cotton threads (size #30). The hook I chose to use was a size #9. There is no closure to mess with because all of my necklaces are slip-ons. This necklace is my finished item. Well done ! It looks lovely. How do you care for this necklace? Can it be hand washed? It's so beautiful, and I assume this necklace would feel so warm on an autumn day! OH MY!! This is Elegant..I crochet alot of my jewelry too; but not as great as this. I do create my own patterns as i go but this looks way more intricate then i have ever done. Very Pretty!!!!!!!!!! !Thanks for sharing your wonderful talent.